The Book of Daniel is another book of the Old Testament that documents the various trials that members of the Jewish faith are forced to endure at the hands of nonbelievers, this time focusing on the titular individual. This is a topic suggestion on Books of the Bible: Daniel from Paper Masters. Use this topic or order a custom research paper, written exactly how you need it to be. 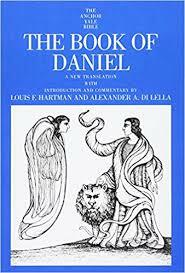 The Book of Daniel is another book of the Old Testament that documents the various trials that members of the Jewish faith are forced to endure at the hands of nonbelievers, this time focusing on the titular individual. Daniel and his associates are taken into the court of Nebuchadnezzar and forced to give up their Jewish traditions. Gradually, thanks to the gift of prophesy and dream interpretation given to Daniel by God, they are able to move upward through the ranks in court, securing for themselves some marginal degree of comfort. Daniel’s various visions, interpretations, and prophecies foretell a great deal about the experiences of the Jews in the coming days, including those both good and bad. All were given different names which honored Babylonian gods, and all underwent what was in effect a three year apprenticeship in the ways of the Chaldeans. All four did exceedingly well and rose to the top of the class. At the end of that time, all four were brought into the King’s palace to serve Nebuchadnezzar. Throughout the book, Daniel experiences a number of visions and is tasked with interpreting various signs and symbols, including dreams. After predicting the death of Belshazzar, Daniel is elevated even further in the eyes of his successor, Darius. Political opponents, however, envy Daniel’s new station and plot against him. When a law is passed denying anyone the right to pray to any God or man for a period of 30 days, Daniel ignores it and continues to pray to his God; he is arrested and thrown into the lion’s den. With God on his side, however, Daniel is not harmed, and the lions’ mouths remain closed. The next morning, Darius awakens to find a still-living Daniel, and realizes his importance. The opponents responsible for Daniel’s predicament are then cast into the pit themselves, showing a gradually-increasing respect for the God of Daniel and the rest of the Jews. The Book of Daniel is one of the great prophetic books in the Old Testament of the Bible. The events in Daniel take place during a seventy year time period from 605 to 536 before Christ. The Babylonians and King Nebuchadnezzar took dominion over the Middle East at the onset of this period by defeating the Egyptian armies in 605 B.C. and then by besieging and toppling Jerusalem later the same year. The invading Chaldeans (Babylonians) took much of what was good from Jerusalem when it fell, including articles of the house of God which were carried to the treasure house of the Chaldean god. They also set their sights on finding some of the children of Israel, some of the King’s descendants and some of the nobles. Specifically, King Nebuchadnezzar was looking for “young men in whom there was no blemish.” He sought the best of the best, those young men who were “good looking, gifted in wisdom, possessing knowledge and quick to understand.” He was looking for young men he could train and instruct in the language and literature of the Chaldeans, young men who could one day serve him in the King’s palace. In Chapter Two of the book of Daniel, King Nebuchadnezzar has a very troubling symbolic dream, and he summons all of the magicians, sorcerers and astrologers from throughout his realm to come before him so that he can find someone who can interpret his dream and tell him the meaning of it. Fearing perhaps that this group will tell him what they think he wants to hear, the King insists that they first describe the dream he had before they begin to interpret it. The magicians, etc., insist that the King tell them the dream first, and then they will interpret. The King does not fall for their ploy and stands his ground. They must tell him the dream first. It becomes obvious that no one can do this, and that the King was correct to doubt their powers in the first place. The magicians and astrologers argue that what the King is asking is impossible, and only the gods could describe his dream. The King becomes furious and issues an order to his King’s Guard to go out and kill all of the wise men of Babylon. Unfortunately, the King’s order would include Daniel and his friends. When the Captain of the King’s Guard finds Daniel, the young man asks for an audience with the King and proceeds to try to turn the situation into one which will glorify the God of Israel, the God of Abraham, Isaac and Jacob who brought the Israelites out of Egypt and into the promised land in earlier days. This is not the god that the Babylonians worship. Daniel asks the King for a little time so that he can pray to God and ask that the King’s dream be revealed. Daniel returns home to join his three friends in prayer. In a night vision, God does indeed reveal the King’s dream to Daniel, and he returns to the palace to advise the King. Before he relates the dream and interprets it, he takes no credit for being wise and capable, instead giving all credit to the God of Israel who has revealed it to him. In the King’s dream he saw a great statue, with a head of gold and body parts made of silver, bronze, iron and clay. As Daniel interprets, these different elements represent empires that God will raise and destroy in the days to come. The golden head represents Nebuchadnezzar, the greatest and most powerful King of all. As the dream unfolds, a great stone is hewed out and when it smashes against the statue it destroys it. The gold and other materials were all crushed together “and became like chaff on the summer threshing floors; the wind carried them away so that no trace of them was found.” Daniel tells the King that all of the great empires to come will be swept away. The great stone that struck the statue becomes a great mountain in the King’s dream and fills the earth. This represents the Kingdom of God will establish with the coming of His son, Jesus Christ. And this empire, Daniel tells the King, shall never be destroyed. Abraham Research Papers explore the life of a religious man, that was the founder of monotheism, and patriarch of three religions Islam, Judaism, and Christianity. Paper Masters writes custom research papers on The Book of Daniel and discuss this book of the Old Testament that documents the various trials that members of the Jewish faith were forced to endure at the hands of nonbelievers.